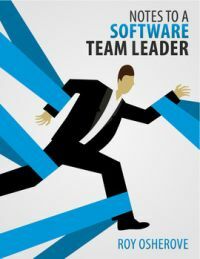 Roy Osherove has recently self-published a book titled Notes to a Software Team Leader. I've first learned about the author several years ago when he was speaking about agile development at TechEd Europe. I've been following his work since then and new about his upcoming book for some time when an opportunity arose to beta-test it. I took advantage of it and managed to read the book before it was finally published. This text sums up my impressions about it. I'm pretty sure the issues about software development that the author brings up will be very familiar to you if you have any experience as a team leader. But the main value of the book is not in bringing them to you attention; it's in its call to action: inviting you to do something about them instead of passively accepting the state you're not satisfied with. It leads you through the author's vision of steps required to reach the ultimate goal of a growing and learning team striving to always do their best job possible. The second part of the book consists of contributions by other authors. Instead of being directly related to the first part, their short notes take different, often thought provoking, aspects to the job of a team leader: usually presenting a potential issue and giving a suggestion how to solve it. They are a nice extension to the core book and give a lot of value on their own as well. I can definitely recommend reading the book to any team leader, no matter how much experience he already has in his job. Even if you don't agree with everything, I'm pretty sure the book will act as an eye opener and make you more aware of stuff you already take for granted, although there might still be opportunities for improvement. You never know, it might even make you a better leader. The book is available on Amazon and Leanpub. If you prefer listening to reading, there's also an audio book alternative.